For the 2001 Hungarian film, see Glass Tiger (film). Glass Tiger is a Grammy-nominated Canadian rock band from Newmarket, Ontario that formed in 1983. The band has released three studio albums. Its 1986 debut album, The Thin Red Line, went quadruple platinum in Canada and gold in the United States. Two singles from that album, "Don't Forget Me (When I'm Gone)" and "Someday", reached the U.S. Top 10. In Newmarket, Ontario, Alan Frew and Wayne Parker, both from local band 'ONYX' along with keyboardist Sam Reid from Holland Landing band 'THE END' were recruited by drummer Michael Hanson with the intent of forming a new band. Hanson at the time was the lead singer and drummer of 'THE END'. After Hanson disbanded the group, the new partnership from the ashes of both bands successfully formed the band Tokyo, which later developed into Glass Tiger in 1983. Al Connelly joined the band in 1983. In 1986, the band released their first album, The Thin Red Line; it was produced by Jim Vallance, with some co-writing by Bryan Adams. This album went quadruple platinum in Canada and gold in the United States. Two of its songs, "Don't Forget Me (When I'm Gone)" and "Someday", reached the Top 10 in the U.S. charts. Glass Tiger won three 1986 Juno Awards: Album of the Year for The Thin Red Line, Single of the Year for "Don't Forget Me (When I'm Gone)", and Most Promising Group of the Year. The album's producer, Jim Vallance, was named Composer of the Year. The band won two more Juno Awards in 1987, and was nominated for a Grammy Award for Best New Artist. The band performed in the United States as part of the Raised on Radio Tour and on Tina Turner's European Break Every Rule Tour. The band released a second album, Diamond Sun, in 1988; the album featured the single "I'm Still Searching", which peaked at #2 in Canada. In 1993, the band went on hiatus. Lead singer Alan Frew released two solo albums before the band reformed and began touring again in 2003. In March 2009, Glass Tiger and members of the NHL alumni visited Canadian Forces stationed in Kandahar, Afghanistan. The visit included live performances and footage was shown on an episode of Entertainment Tonight Canada. 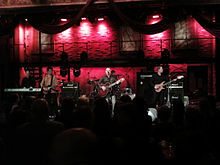 The band returned to Afghanistan for a second performance in 2010. In 2012, Glass Tiger toured across Canada with the band Roxette, and performed as part of Penticton, BC's "Rock The Peach Music Fest" On July 1, 2013, Glass Tiger performed a free concert in Leduc, Alberta as part of a Canada Day Celebration. Glass Tiger performed at a number of festivals in the summer of 2017. On September 23, 2017, Glass Tiger performed at Canada Games Plaza in Prince George, British Columbia. The free concert was held to thank the city for receiving over 11,000 evacuees from the southern interior who had been displaced by various wildfires. In February 2018, to celebrate 31 years of making music together, the band released an album entitled 31. Produced by Scottish/Canadian country artist Johnny Reid, the album includes special guest contributions from Julian Lennon ("Thin Red Line"), Alan Doyle ("My Song"), Véronic DiCaire ("Someday") and Susan Aglukark and David R. Maracle ("Diamond Sun"). "You're What I Look For"
"Rescued (By the Arms of Love)"
NB: "My Song" (1988) missed the Billboard Hot 100, but peaked at number 71 on the Cash Box Top 100 Singles chart. NB: "Don't Forget Me" and "Someday" both reached the Billboard AC chart, peaking at #30 and #4 respectively. ^ Michael Sutton. "The Best of Glass Tiger: Air Time - Glass Tiger | Songs, Reviews, Credits, Awards". AllMusic. Retrieved 2014-01-26. ^ Glass Tiger. "Glass Tiger | Music Biography, Credits and Discography". AllMusic. Retrieved 2014-01-26. ^ "Nominees and Winners - Glass Tiger". Juno Awards website. Accessed 2018 01 12. ^ a b Artist: Glass Tiger CANOE -- Jam! ^ Persico, Amanda (2009-03-20). "Glass Tiger boosts military spirits". YorkRegion.com. Retrieved 2009-04-05. ^ "Happy Alan Frew Talks 1980s Music, New Glass Tiger Album and More!". Music Life Magazine, by Jim Barber, October 29, 2017. ^ "Thank You PG celebration rocks Canada Games Plaza". Prince George Citizen. Retrieved 2017-09-26. ^ "Glass Tiger – Chart History: Billboard Hot 100". Billboard. ^ "Glass Tiger – Chart History: Billboard Hot Mainstream Rock Tracks". Billboard. ^ Roberts, David (2006). British Hit Singles & Albums (19th ed.). London: Guinness World Records Limited. p. 228. ISBN 1-904994-10-5.